Our Re:Sell platform was borne out of seeing our customers frustrated when an event had sold out and they could not get hold of tickets through legit web sites. With the amount of secondary websites hiking up ticket prices currently in the market place, we created a system where by customers can return their tickets (currently on sold out shows) with confidence. This means customers feel safe knowing they can return their tickets and also to get the chance to purchase a ticket on a sold out show. So....How does this all work? On the screen that appears, click 'Enable' to activate Re:Sell. How the resale process works? The customer will phone Skiddle's customer services and ask for their ticket(s) to be marked for resale. The tickets will then be put up for resale either immediately or at a pre-agreed date/time. Once the ticket(s) are resold then the customer will get a face value refund. The customer who bought the ticket(s) will have new barcoded tickets sent out to them. What’s the advantage in offering a resale of tickets? Having tickets held by customers who cannot attend the event encourages resale via social media channels and secondary ticket sites - both of which are out of your control and may lead to the price being increased by the seller. This only benefits the seller and leaves the new customer out of pocket, as well as causing potential issues for you to deal with, such as scamming/fraud. Our resale process ensures ticket transfer is done within our system so we can guarantee the authenticity of tickets. We also prevent resale above face value. Ticket resale reduces the number of ‘no-shows’ at your event, increasing bar and merchandise spend. Is there a cost to myself or the customer? There is no cost to yourself. The customer reselling their ticket will forfeit the booking fee they originally paid, as this will not be refunded. The new customer will pay the face value plus any applicable booking fee, as usual. No, only the face value of resold tickets will be refunded to the customer. Does this affect Skiddle's ‘fair refunds policy’? If your event is cancelled/postponed, refunds will be processed as usual. Will tickets be released sporadically as/when they become available, or released in one batch? You can decide which of these release methods best suits your event. For events with one type of ticket, we advise to release them as they become available. For events with more complex ticketing, we advise releasing them in batches, as this gives customers the best chance of purchasing the tickets they require. To resell as the tickets become available, please leave your tickets open. To resell in one batch, please close/hide your tickets then reopen when you wish to release. Which tickets can be resold? Only tickets which are using our RapidScan service can be returned and resold. This is to ensure we can guarantee the tickets have been cancelled and reissued. What will I see on the event when a batch of tickets are released\tickets are returned? What happens to the barcodes of resold tickets? The barcodes of resold tickets will be automatically cancelled when the tickets are marked for resale. Once resold, a new barcode will be generated and sent to the new buyer. The original buyer will not be able to use their ticket to enter your event and will be notified by email of this. What will happen if a customer wants to resell a first release ticket, but we are now on to a further release? The ticket will go back in the the 'selling pool' and will be resold at the current price. If you use our automated ‘ticket tier’ system, this will happen automatically. Otherwise you can manually override which tier a ticket should be resold at. The original buyer will be refunded the full amount they paid for the ticket if sold, and any extra funds generated from the ticket sale will go directly to yourself. Can I override which ticket type is resold? Yes, for any ticket type you can manually nominate a different ticket type to be resold if you wish. What happens to deposit/balance tickets? The customer must have paid all parts of a deposit/balance ticket to be eligible to resell. Once resold, the original customer will be refunded for both the deposit and balance tickets. You should nominate which ticket should be sold as a replacement. What will happen if a customer puts a ticket up for resale but the ticket doesn't get resold? If a customer's ticket doesn't get resold by a specified expiry time, then that customer will be notified and will keep their ticket. What will happen if a customer order is only partially resold? If a customer's order is only partially resold, then the customer will keep any tickets which have not been resold and will only be refunded for the resold tickets. What happens if I’ve already been remitted for the tickets which are being resold? A charge will be added to your account for the resold ticket(s) you’ve already been paid. You will then receive a new remittance for the new ticket sale. If they are the same amount, this will net zero. If the new ticket is at a higher tier, you’ll receive the difference. Where will it show tickets that are pending resale? There will be numerous pages in the promotion centre which will show how many tickets for your event that are for resale. - Within the tickets overview page, the bar graph showing tickets sold will show tickets pending resale. this will show up as a blue section in the graph and also underneath the graph. - This page will also provide a full breakdown, via the “Resold tickets” menu. 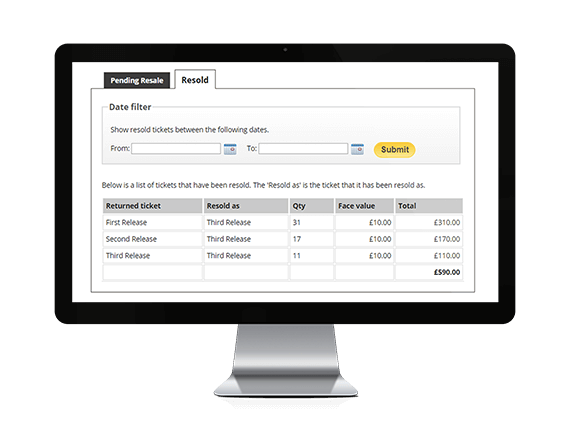 - Within the orders admin screen the table will highlight a returned order with a red box and a returned arrow. How is the order of resale tickets determined? All tickets are returned to a ‘resale queue’ with those returned first at the start of the resale queue. Do I have the option of choosing what tickets can go on for resale? Currently all tickets will be eligible for resale if you opt to use this service. Can I opt out of reselling? Currently this is an opt-in service so will only be available if you specifically enable it. If I put more tickets on sale for the event, how will this affect the resale? Your new tickets will be sold before any resold tickets are offered for sale. Will having tickets on resale alter live ticket counts? Your ticket counts will only change if/when a ticket is resold. Because tickets are effectively transferred from one user to another, your ticket count should not change. The exception to this would be if you are accepting a ticket which is to be resold at a higher tier, in which case the lower tier count will be reduced, and the higher tier will be increased by the same amount. 4x Earlybird tickets are resold. They are resold as 3rd release, so the count for earlybird will be reduced by 4, and the count for 3rd release will be increased by 4. When will the resale finish? Resale will expire 12 hours before your doors open by default. However you can change this by editing ticket settings. At this point any tickets which haven’t been resold will be returned to the original customer. If you close your tickets early, any tickets pending resale will be returned to the original ticket buyer. What happens if I postpone / cancel my event and there are tickets on for resale? If the event has been cancelled then the tickets on for resale will also be cancelled. The original purchaser will receive the refund. What happens if the customer wants to go to the event that they have resold their ticket for? Is there any way of reversing the process? Once tickets have been resold, this cannot be undone. The customer would need to purchase new tickets. Will this mean I won't make as much money from ticket sales? If we are reselling tickets won't i miss out on another ticket sale? This facility is only available once your tickets have sold out. Therefore you will not miss out on any additional sales as you’ve indicated that you’ve already reached the allocation available. Are there limits to how many tickets can be returned for resale, either volume of tickets or value of order? Customers can resell any number of tickets within their own order. There are no restrictions apart from this.